"Bama Dave" (who marched with Southwind in 2002 and 2003, and who will march with the Boston Crusaders in 2004) sent in this one. "This pic was taken during my second summer with Southwind, playing bottom bass. Next summer I will be coming out on second bass with the Boston Crusaders. Joining me in the pic is Jon K. (Minnesota), Arjay D. (Minnesota), local park ranger (San Antonio), Joe W. (Indiana), and me, Dave B (Florida). 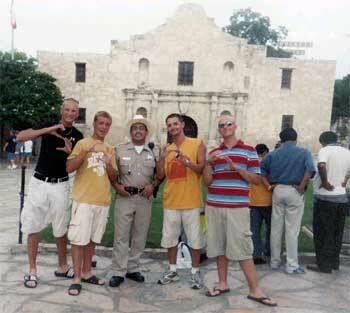 Man, I sure will miss you guys ... "This picture was taken during our free afternoon in San Antonio. Our little group decided to get a pic with one of the locals." Thanks!